This cashmere beaded sweater came from Hong Kong in the 1950s – my dad bought it for my mother on their honeymoon. I have a beautiful vintage beaded sweater that belonged to my mother. She gave it to me many years ago when she was going through some old clothes and I tucked it away to preserve it. It was already showing signs of age and I didn’t want it to get worse, so I bought a good garment bag and stored it in my guest room closet. This week I was at my favorite thrift store and was about to leave when I made one more pass through the jacket section. That’s when I spotted it…an off-white colored beaded sweater with a Hong Kong label. 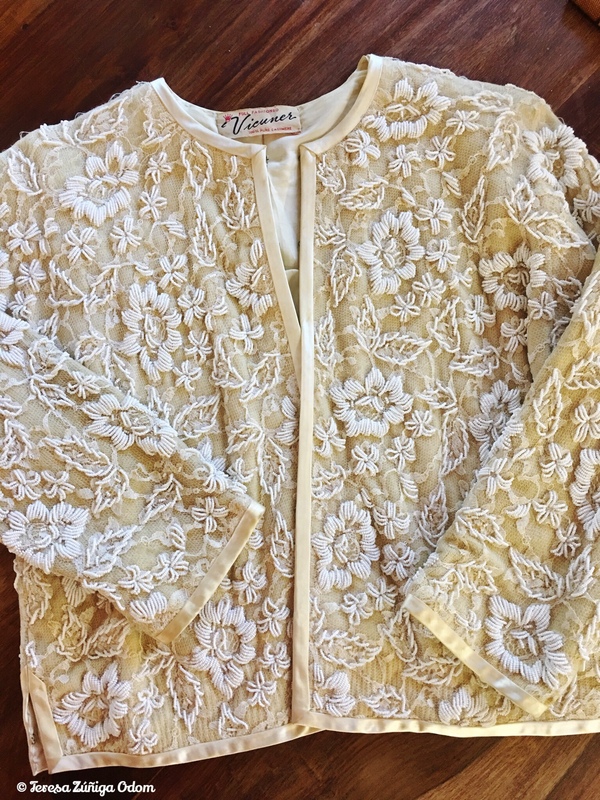 It was gorgeous and in incredible shape and only $4.99…and as I picked it off the rack, that’s when all the memories rushed back to me about the beaded sweater from my mother. The Kung Brothers beaded sweater I found at the thrift store last week for $4.99 – made in Hong Kong. Sleeve detail on the Kung Brothers beaded sweater I bought at the thrift store! After my parents got married in Cambodia, they went to Hong Kong for their honeymoon. My dad was always insistent about buying quality items. I remember one Christmas when I was in high school, I wanted a small stereo and I knew money was tight so found one at a discount place for about $50 and showed it to my mother. When Christmas rolled around, I didn’t get that discount place stereo. Instead, my dad went and bought a Magnavox stereo complete with stand and headphones! I had that stereo for years too. So I can just imagine my dad in Hong Kong with his new bride making sure it was a memorable experience. I think this is when he bought mom two beaded sweaters…one in black and one in off-white. Both were cashmere and both were stunning! I remember as a little girl putting them on and they were – still are – quite heavy! The detail in the beads was always amazing to me. I could not imagine the time it took to create these masterpieces and I would turn it over and over admiring the detail of the beaded design. These sweaters symbolized glamour to me. When I tell people about my parents, where and how they met in Bangkok, and then tell them about their wedding in Cambodia, people always comment on how exotic and exciting their lives sounded. Growing up I loved looking at my dad’s photos of their time in Cambodia and Thailand and also the photos he took of my mother. before all us kids came along. I especially loved the photos of mom all dressed up for nights out with dad. My mother had the glamour factor going for her big time in my little girl eyes. She would wear her blonde hair up in a French twist and dress up in one of her hand-made (to fit her figure) Thai silk dresses or suits. She would then add her favorite black peau de soie spike heels and on cooler nights out, she would add one of the beaded sweaters. She looked like Grace Kelly to me. I know my dad probably took many pictures of my mother wearing these beaded sweaters but I’ve only come across one in the slides that I’ve scanned and archived. In this photo, mom is at a dinner party in Puerto Rico in the mid-1960s wearing a blue Thai silk dress, the peau de soie shoes I mentioned, and the black beaded sweater. There is also a photo of mom and her best friend Gladys and another woman (not sure who she is) before they left for the party. The more I looked at that photo the more I think Gladys is wearing the off-white sweater! The photo is a little overexposed and while I worked on it to see if I could identify the sweater, I wasn’t able to say for sure. Still…mom and Gladys were very close and don’t girlfriends share clothes at times? I’m going with the idea that Gladys IS wearing the sweater. Mom’s best friend, Gladys Seda is on the left with what I believe to be the off-white beaded sweater that I now have. Mom is on the right in her blue thai silk dress. This photo was taken at our house in Puerto Rico in the mid 1960s. My mother is on the left wearing the black beaded sweater at a dinner party in Puerto Rico in the 1960s. It’s funny how a piece of clothing can bring back such memories. I need to talk to my mother about these sweaters again. We’ve talked before but I need a refresher and I always love watching her face when she reminisces about these early years. Meanwhile…I’m still on the hunt for a photo of mom in the off-white sweater! This entry was posted in Photography, Puerto Rico, Thrifting, Zuniga Family and tagged Beaded Sweaters, Hong Kong Beaded Sweaters, Kung Brothers Hong Kong, Thrifting, Vintage clothing on April 9, 2018 by Southern Señora. Fiesta – Celebrating in Full Color / Celebrando a todo color! encouraging the world, one encounter at a time. A geek who's married to a geek & geeks out on more than she should. I'm not claiming to be a fashionista...just a budding one. Magic City Raised, DC and New York Made... One girl's journey to discovering just how sweet Alabama is.